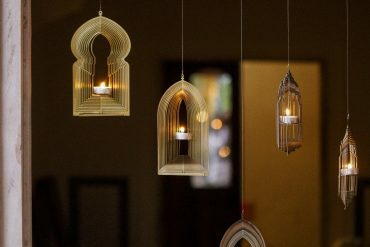 Of late, there’s been quite a spurt of restaurants across the country showcasing creativity with modern Indian cuisine. While some are great and others a tad gimmicky, the fact remains that there’s just one chef who can be credited with starting this trend as far back as in 1993. 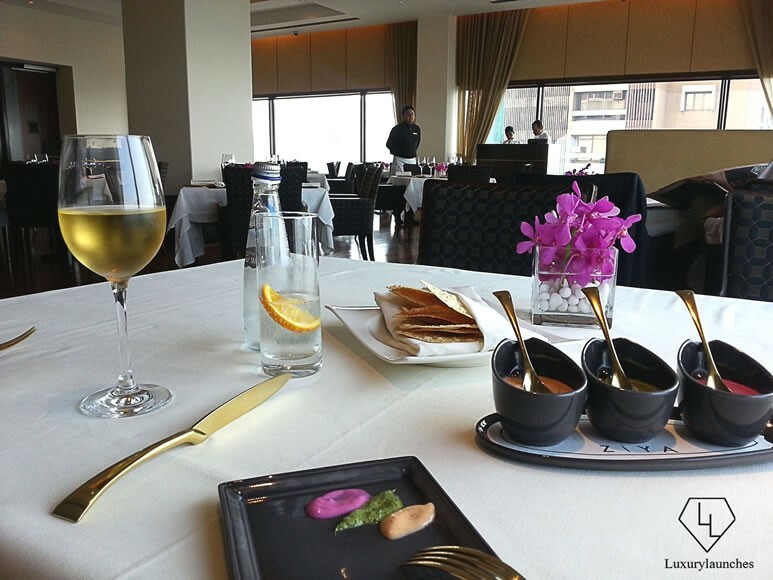 Chef Vineet Bhatia, with a clutch of restaurants to his name (two of them still gleaming with Michelin stars) has broken many rules and created some of his own down the decades. 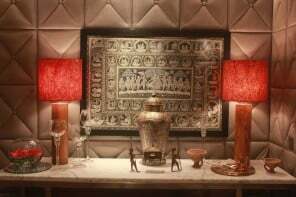 You may be one of the fortunate ones to have rung the doorbell at his famous Rasoi, an intimate restaurant in a 100-year-old townhouse in London’s Chelsea or been to one of his Rasoi by Vineet ventures in different parts of the world. But for many Indians, the only exposure to his brilliance would perhaps be via the TV programme – A Twist of Taste – that he hosted for a while. 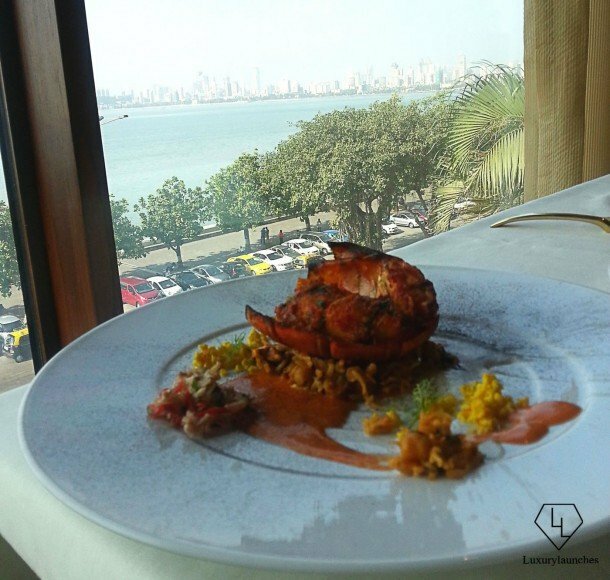 If you’ve been impressed by his culinary knowledge on that show or through the book he has authored since, you might want to visit Ziya, the exquisitely elegant restaurant at the Oberoi where he has reigned supreme since 2010, giving Mumbai a taste of his ‘evolved Indian’. 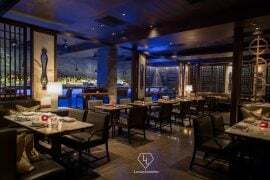 Recently, we had an exclusive sneak peek into the brand new tasting menu at Ziya that’s freshly fleshed out from Chef Vineet’s imagination. 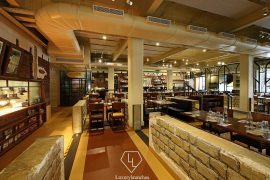 Called the Gourmand Menu, it comprises seven courses, including a Saffron Sorbet and Champagne palate cleanser separating the appetizers and the mains. 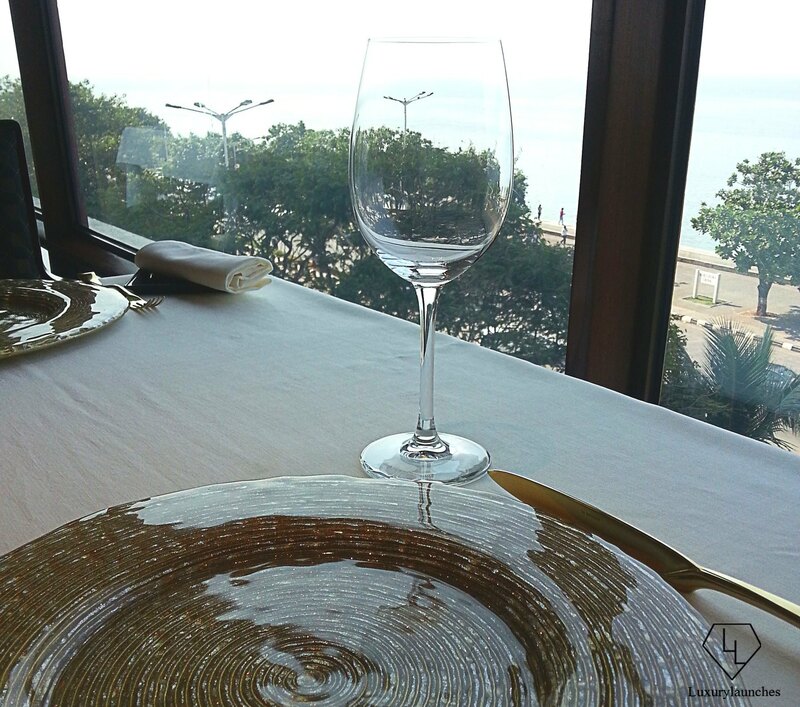 Nicely settled in with our wine and the fabulous sealicious sweep of Mumbai’s Marine Drive, the glam golden charger plates cleared and the gorgeous Italian La Tavola flatware at the ready, we allowed our minds to meander and not try to anticipate the treats in store. Chef Vineet had made a brief appearance to say hello and to tell us that he wasn’t going to tell us what to expect! It seemed almost a little sacrilegious to munch on the roasted papads and three dips while we waited. 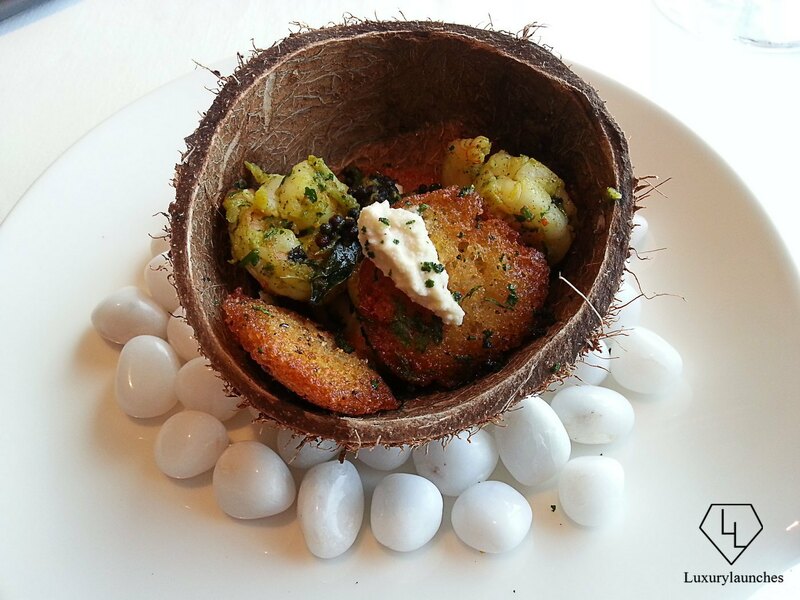 The first appetiser – a Grilled Curry Leaf Prawn – arrived, almost a natural progression from the sway of the palms on the street below, as it was served in a broken coconut shell, balanced on polished white pebbles. 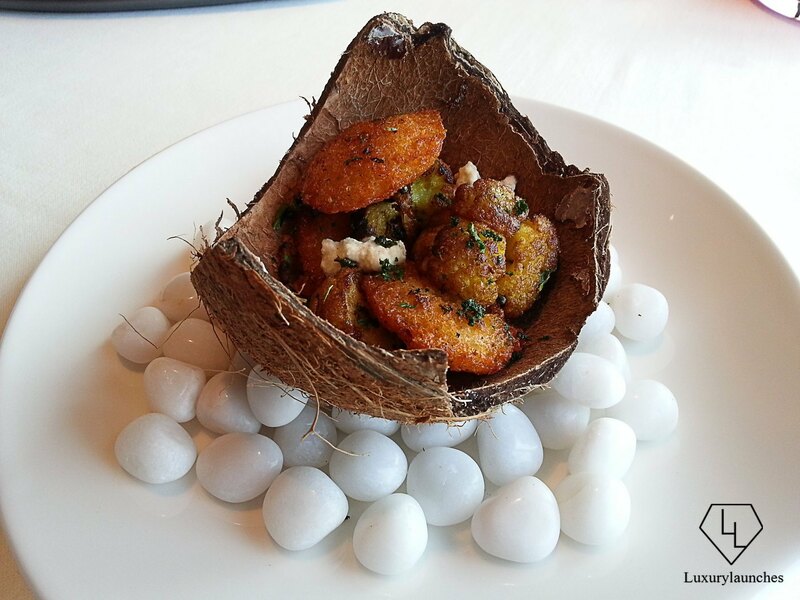 Nestled inside the shell alongside the succulent prawns were also some crisp, lightly fried cocktail idlis with a smattering of sambar podi for a hint of fire and a dash of fresh coconut chutney to douse the flames. The vegetarian version replaced the prawn with some juicy cauliflower. We were surprised to see this, as we would have expected something more South Indian like raw banana or tapioca in its place. Both the vegetarian and seafood dishes were delicious, nevertheless, and were gone before we knew it. 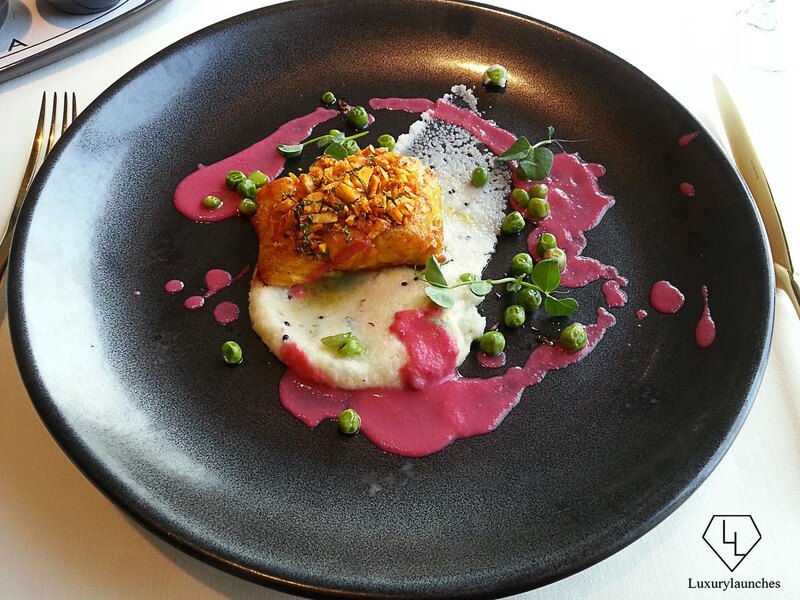 The next course took the common man’s staple, a green pea upma, and gave it gravitas as the base for picture-perfect plating that incorporated abstract splashes of beetroot saar in fuchsia and the precision of carefully sliced and grilled Chilean Sea Bass topped with Macadamia nuts to create the Macadamia Machhi. The Baingan version had a generous slice of velvetty aubergine, done to perfection, which complemented the gravelly texture of the semolina upma wonderfully. 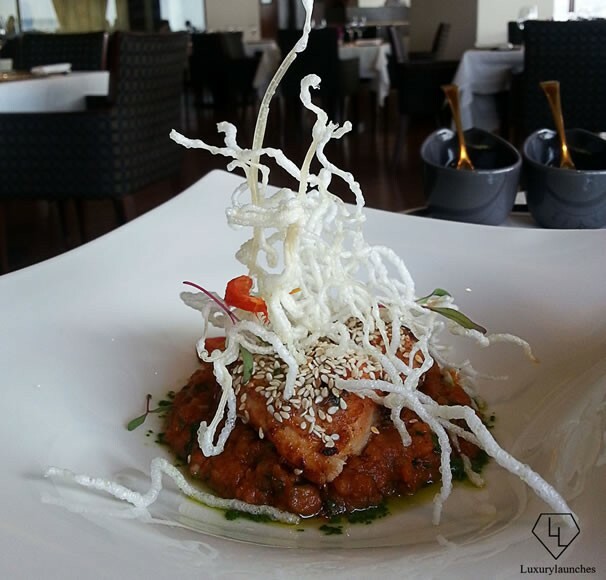 The Lasuni-Til Chicken Tikka as well as its Paneer avatar, encrusted in nice toasty white sesame, sat on a bed of what Chef Vineet has dubbed ‘Chowpatty bhaji’. This was the usual mixed and mashed vegetables from pav-bhaji, but made sublime by the execution, juxtaposition and the addition of idiyappam slivers that had the crunch of sago crispies. 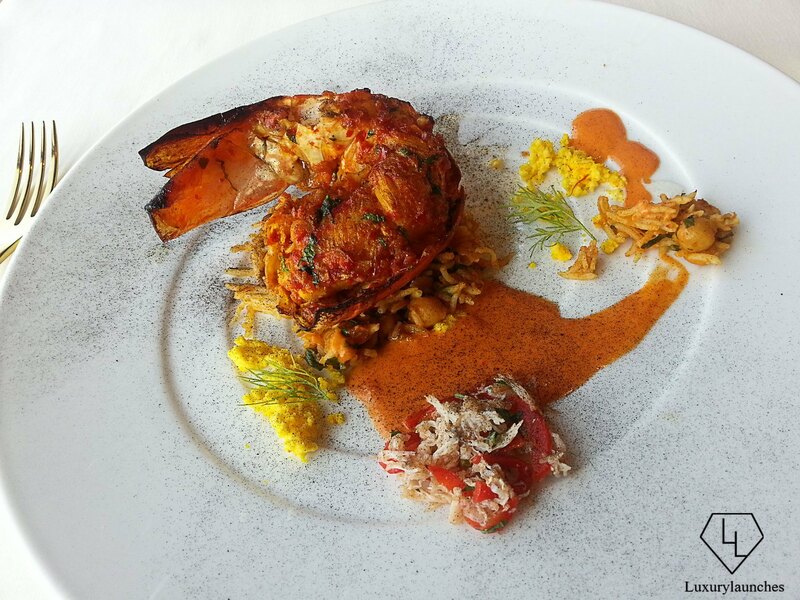 Similarly, the following dish too, drew from Mumbai’s street food by pitting the unlikely chickpea-spring onion tawa pulao against the sweet meat of a Chilli Burnt Butter Lobster served on the shell, then adding a crab and red bell pepper chutney to the brawl! 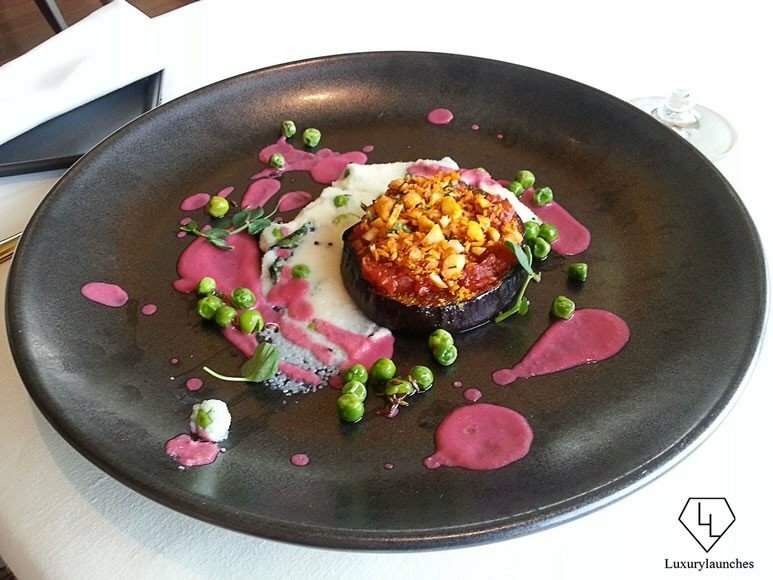 As if that weren’t enough to create a furore on the tongue, Chef Vineet came to create some table-side drama with a little white potli of a mysterious black something that he proceeded to dust onto our plates! “You have to have fun, otherwise what’s the point of life,” he said with an enigmatic smile, as our eyes widened in wonder. Soon enough though, the aroma gave away the secret… onion burnt to a crisp, powdered, and then added to the plate for a bit of bitterness that actually enhanced the other flavours on it immensely. Who would’ve thought! The green version of this dish had some melt-in-your-mouth seekh made of pumpkin and flavoured with dill. 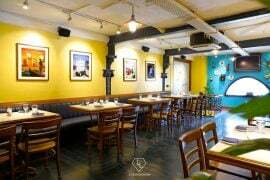 The crab was replaced with edamame, which made for a crisp side salad with the red bell pepper, which bore the simplicity and freshness of a Maharashtrian koshimbir, we pondered. 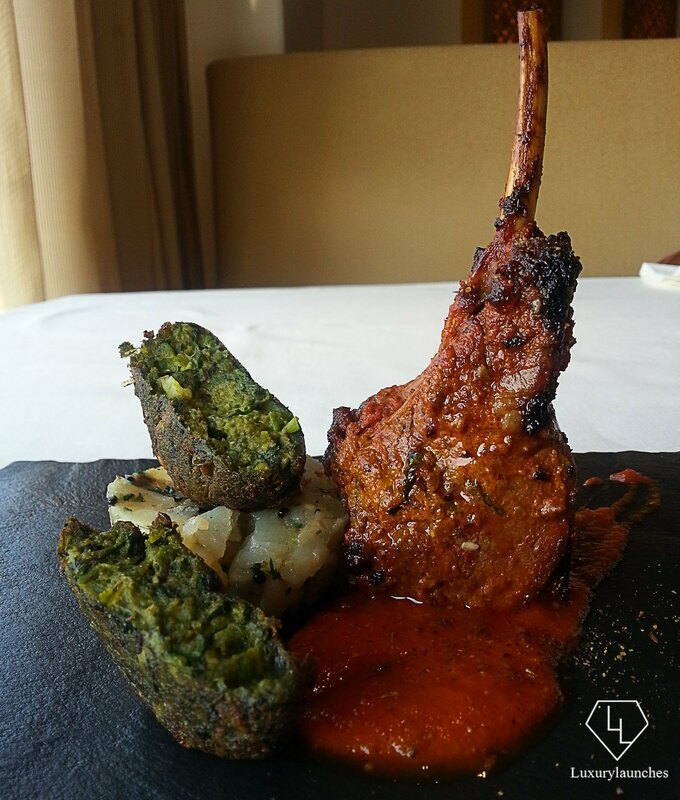 Breaking into our thoughts, the spectacular looking Achari Tandoori Lamb Chop arrived at the table next. It was accompanied by potatoes cooked with perfectly tempered mustard, a spinach tikki as cohesive as a galouti kebab, and a pool of beautiful saunf makhni gravy, redolent with aniseed. The stuffed bottle gourd or Achari Lauki Bharwaan with all the same accompaniments, despite tasting really good, appeared a little lack-lustre in comparison with the lamb. These were flavours that anyone with a penchant for North Indian food would find familiar and comforting and yet the pickle and aniseed added zing and depth. 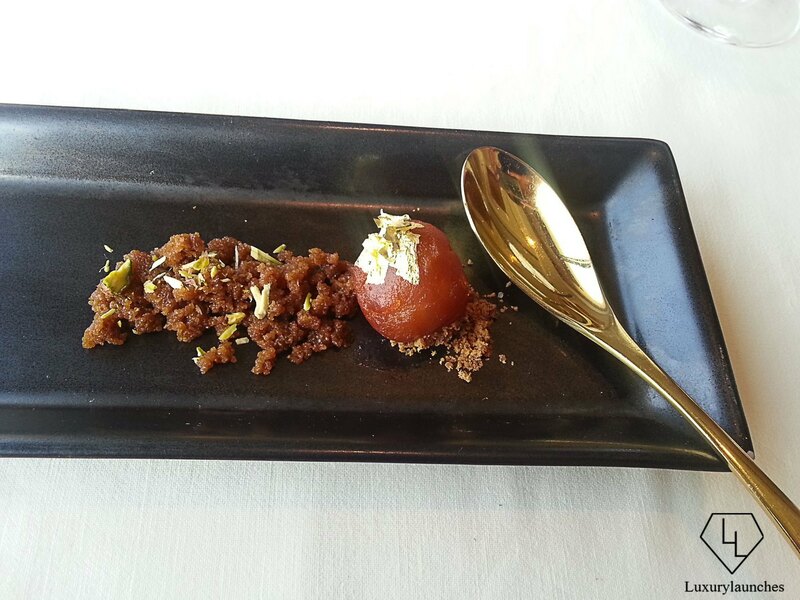 Instead of the Halwa-Kulfi dessert that is now being served as part of the Gourmand Menu (it does sound tempting – a warm coffee halwa, cardamom chenna, caramelised banana kulfi and boondi! ), Chef decided to give us a glimpse of the platter that is on its way off the menu. The star of this was certainly the miniature dark chocolate bar, delicately tinged with the taste of aniseed. It’s probably a result of his collaboration with Swiss master chocolatier Philippe Pascoet with whom he’s launched a range of chocolates in Rasoi Geneva. 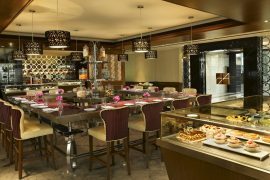 But the bar and each of the elements on this cunningly crafted dessert board is a revelation… from the chocolate dipped Mysore Paak to the Chenna and Pecan Rabdi, the little Orange and Chocolate Panacotta, the cute-as-a-button Banana Bread Doughnut and the Cashewnut Kulfi cone. 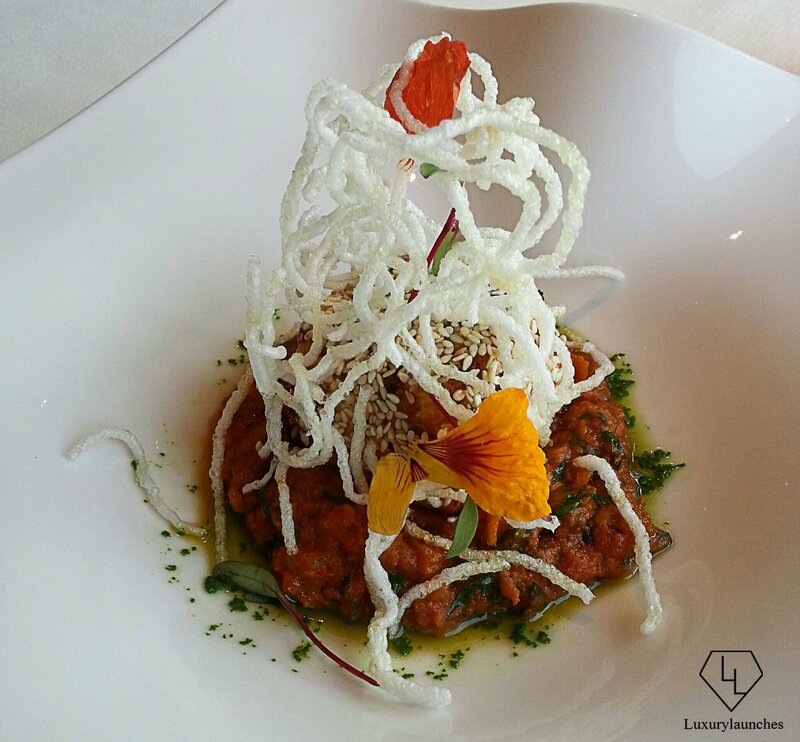 We hope it comes back onto the Ziya menu in some form soon. As an end to a long and interesting lunch, memories of which will last a lifetime, it was especially apt. 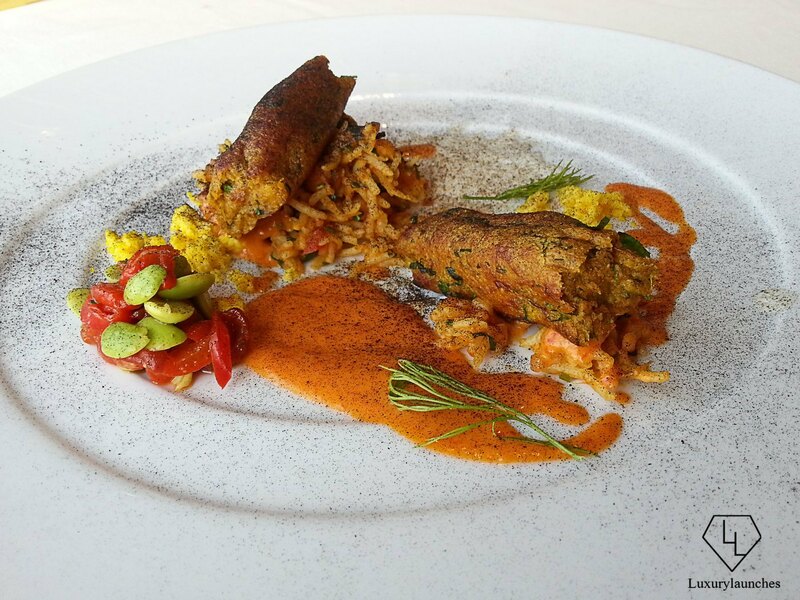 It was also the perfect reminder of all the things we’ve admired about Chef Vineet’s work. 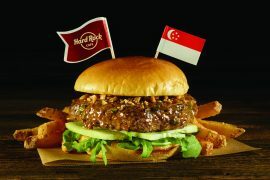 It’s the playfulness combined with precision plating, the attention to detail and seasoning even as he decides to present a dish in a dramatic mess… everything combines to make a meal conceptualised by him truly memorable. He’s an explorer. He’s an artist and a poet. He’s a parent. He’s a child. He’s a chef. 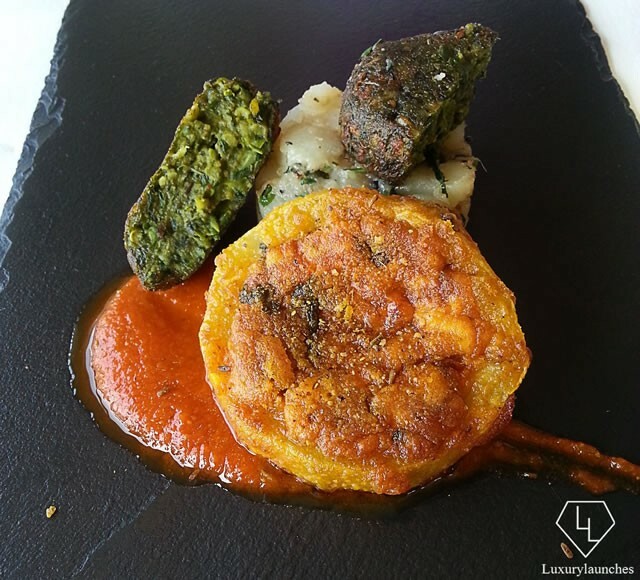 And we were just incredibly fortunate to witness Chef Vineet Bhatia’s genius firsthand.